Christmas in Vegas | Conquering Vegas begins here. Sharing my love and thoughts on everything Vegas. Aunt Sue smeared red lipstick on my cheeks. The musty red pants and jacket trimmed in white grated against my skin. Countless uncles, aunts and cousins adorned the costume throughout the years and, somehow, it was now my turn. Aunt Sue called me just a few days before Christmas and asked me the question that I undoubtedly knew would result in a catastrophe. What I didn’t realize is that it would ignite a chain reaction of failures that would scar me forever. “Can you be Santa this year?” she asked. I replayed the conversation in my mind as she put the finishing touches on my look and adjusted my beard and hat. “She won’t know and if she figures it out, I’ll handle it,” she said. As I prepared for my first, and last, appearance as Old Saint Nick, I reminded myself that if I would be on a flight to Vegas in just a few short hours. Vegas during the holidays is a special place to be. My first day in Vegas was New Year’s Day. On my next trip, I celebrated New Years Eve at the Hard Rock. And, with a few summer trips in between, I looked forward to the day when I’d land in Vegas to the pilot, flight attendants, cab driver and hotel desk would wish me a “Merry Christmas” in Vegas. I’m a Vegas guy but I’m also a Christmas guy and a Christmas Eve baby. 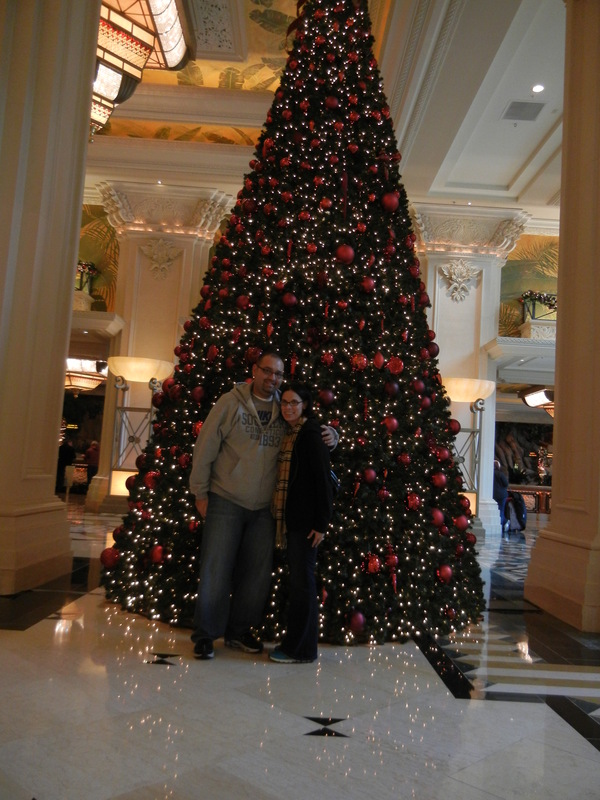 Needless to say, I was excited to combine my love of Vegas with my love of Christmas. But first, I needed to play the role of Santa. I could hear Anne’s cousins Cailyn and Ava dancing around the living room asking when Santa was coming. Cailyn was seven and had begun questioning Santa’s legitimacy. Her parents had gone so far as to leave a hand-written note carefully crafted by a friend of the family to mask the handwriting and a single white glove, complete with chocolate chip cookie stains. She had sealed the glove and note in a Ziploc bag and told the entire family the story while, downstairs, Aunt Sue instructed me on how I would make my grand appearance. My mission was to wait until I heard the manufactured reindeer hoofsteps on the ceiling and then begin “ho ho ho-ing” from the deck. I sprang from the basement with presents I gathered. Tore open the screen door and prayed they fell for my cheap beard and mustache. That’s all I could muster. Very few feelings are as terrible as taking the magic of Christmas away from a child. Ava seemed to be clueless but Cailyn was acutely aware of what had just transpired. She ran to Aunt Sue, her Grandmother, who said something about Santa having to visit a lot of children and that I was filling in but it was too late. The damage was already done. I don’t remember exactly what happened from there. Shortly after the Santa debacle, I found myself back in the basement racing to get out of that costume. Scrubbing my face over the sink, soap mixed with tears as I struggled to remove all remnants of my Santa failure. I dressed slowly as I was too embarrassed to show my face to the family. Anne came downstairs. Yes. She really did say that. The seven-year old forgave me for basically ruining her Christmas forever. As I put myself back together, Anne reminded me that we would be on our way to the airport soon . Vegas is a surefire way to change my attitude about anything. So, I returned to the family. They laughed at my expense but I found no humor in what happened. I still don’t. But, at least things can’t get worse, I thought. When I finally emerged from the basement, Cailyn’s Mom, Alyson, assured me that she was fine. “You did ya best,” she said in her New York accent. “Cawl and check to make sure your flight is running on time,” she advised. Please. This wasn’t my first time to the show. No delays or cancellations in New York. After opening presents, enjoying Christmas dinner and having a cup of coffee, Anne and I were ready for Christmas in Vegas. We were on way to Sin City and jumped on the Van Wyck. To the fountains, conservatory, Olives and Bellagio Buffet! We’ll hit the Miracle Mile, Forum Shops, Venetian and Cirque Du Solei! With time to spare, we parked our car and began the cold trek across the parking lot to the terminal. My Santa failure faded into the gray Queens sky behind me as the Christmas and Vegas spirit filled my core as I took in the frigid air. We pulled up to the counter. The Delta representative greeted me with a hearty, “Merry Christmas!” We presented her with our credentials and she began clicking away at her screen. The process seemed to be taking a little longer than usual. “Everything all right?” I asked. “Ummm…you’re at the wrong airport,” she replied. From the depths of New York I pleaded! Who can you call? Help us get away! get away! Get away from this all. The best advice they had at JFK was to get to Laguardia. Without a word, I grabbed our suitcases and raced back to the car. I was determined to make the flight. Our flight was in two hours and Laguardia was only 20 minutes from JFK. The clock was ticking. Punching and grunting, I felt like a complete doof. We made it to Laguarida with less than an hour to our flight. We ran to the counter hoping for mercy and a Christmas miracle. 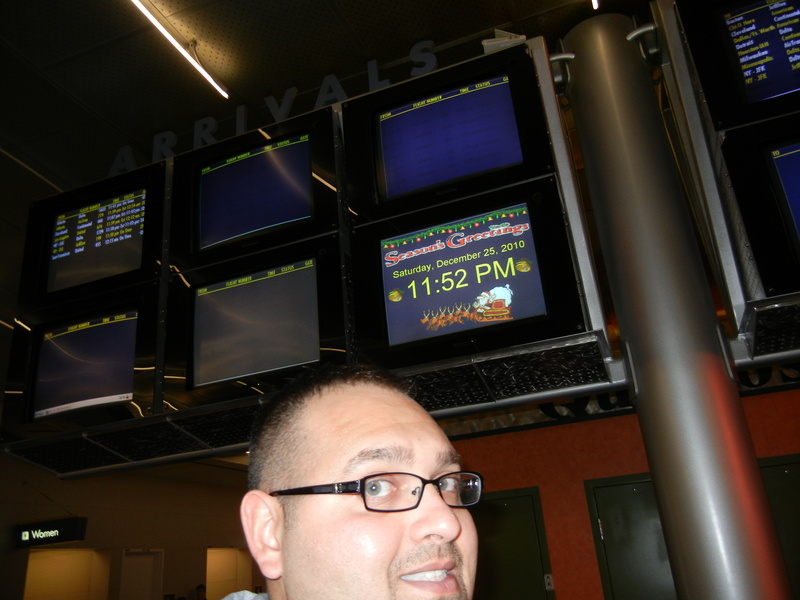 When we finally attempted to check in for our flight, we were too late. The Delta representative, Angela, was incredibly kind. We simply had no options. We rebooked for the following day, I called Planet Hollywood and they nicely accommodated our request and added a day to our reservation. Similar to the moments after ruining Cailyn’s Christmas, I don’t remember the walk back to the car. For the 2nd time on this Christmas, I found myself ashamed and embarrassed and pondering my failures. Sitting in my car at the Laguardia parking lot with the motor running, I made phone calls to a few friends and family members letting them know that we weren’t on our way to Vegas. So ashamed of my moronic error, I lied and said that we just rearranged our flight to leave on the 26th. Anne and I had barely exchanged a word since the Delta representative said, “Umm…you’re at the wrong airport.” I knew I couldn’t avoid it any longer but all Anne said was, “It’s ok. I forgive you.” I temporarily lost all emotional control and just broke down. How can this have happened on Christmas? From my failed performance of St. Nicholas to an empty seat in the air and me on the ground. We spent the night at Aunt Sue’s. 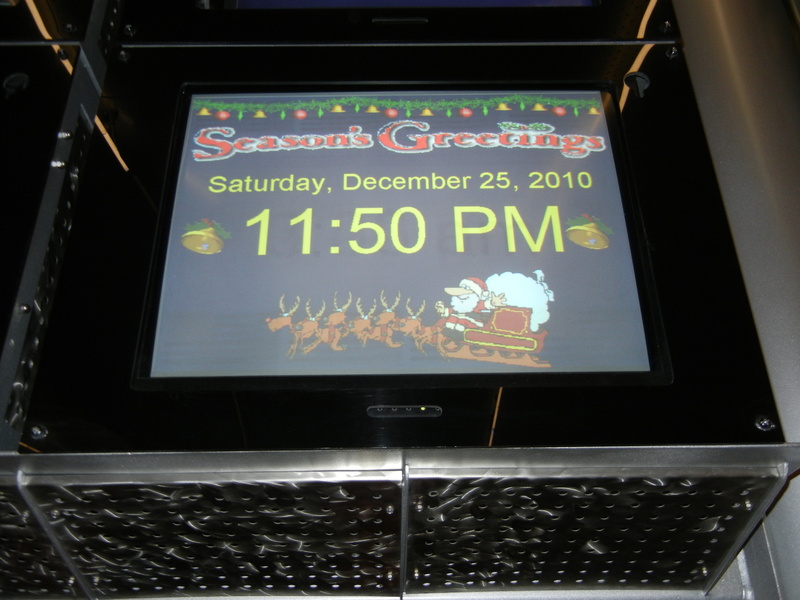 Our flight was scheduled for the mid-afternoon on December 26th. I barely slept and the next day, I checked on our flight almost continually and I made sure that several people checked that we were going to the right airport. We arrived at JFK three hours before our flight. We sat by the gate, so thankful my wife never gave me any flack. Her eyes—with that Vegas twinkle! She began to smile, well, barely. For weeks we hoped for a Vegas Christmas so Merry. Anne and I stood at the window and stared for quite some time. We had a great view of the Bellagio Fountains and, could even hear the music. Christmas songs played as the fountains danced. Normally, on the first night in Vegas, I can’t wait to go out and explore but everything caught up with me and I passed out with a smile and the fountains dancing in the background. That trip was fantastic. We saw some great shows, had some luck in the casino, loved our stay at Planet Hollywood and dined in places that we would return to several times. But, it was that view that made the difference. Every morning, Anne would sit by the window with a coffee and enjoy the view and every night, we would spend some time watching the fountains dance. A few years later, I finally got to Vegas on Christmas day and, while I loved it, it is the worst Christmas ever that will be etched in my memory forever. And we look forward to our Vegas trips which always shine and never fizzle. Vegas 26: Go Knights Go! !